Liquiflo gear pumps are manufactured from high-alloy materials such as 316 Stainless Steel, Alloy-C and Titanium, and a variety of corrosion-resistant and wear-resistant internal materials. Liquiflo gear pumps can be configured with packing, single or double mechanical seals or magnetic-drive. These options allow Liquiflo gear pumps to be specially engineered to handle many difficult chemicals - such as polymers, solvents, acids, caustics or other corrosive liquids - over a wide range of viscosity, pressure and temperature. Liquiflo gear pumps are typically used for metering, circulation, transfer and injection applications. Liquiflo Gear Pumps are available with several ancillary options and accessories. These include temperature control jackets, gear reducers, variable speed drives, air motors, relief valves, repair kits, replacement cartridges and base plate mounting. All Liquiflo gear pump models are available in close-coupled configuration. This feature makes installation quick and easy, since it eliminates the need for manual alignment of the pump and motor, and pump lifetimes are significantly extended since perfect pump-motor alignment is guaranteed. 4-Series and 2-Series. Each series includes several models in order to suit your particular flow rate. The H-Series is our most popular and versatile gear pump line and was designed as an upgrade to Liquiflo's original 3-Series. We recommend the H-Series for all new applications as well as an upgrade to any existing 3-Series installations. 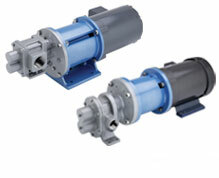 The H-Series Gear Pumps were designed as an upgrade to Liquiflo's original 3-Series. With similar outside dimensions and capacities, the H-Series incorporates larger diameter shafts and bearings, allowing them to handle higher pressures with extended service life. 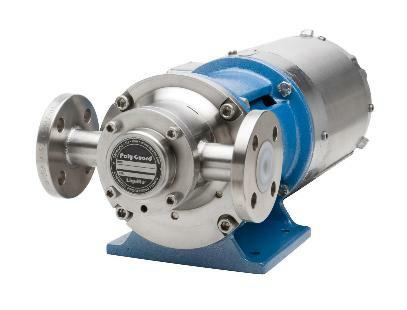 H-Series pumps are available in Sealed and Mag-Drive versions with flows up to approximately 55 GPM and differential pressures up to 225 PSI with 300 PSI possible on some models. Liquiflo's original 3-Series Gear Pumps are available in Sealed and Mag Drive versions with flows up to approximately 55 GPM and differential pressures up to 100 PSI. The Max® Series Gear Pumps feature helical gears and relieved wear plates for smoother and quieter operation and intrinsic reduction of gear separation forces. Their unique and durable design will ensure extended life in high pressure pumping applications. The Poly-Guard® Series Gear Pumps were designed to handle the most corrosive chemicals, such as inorganic acids, alkalis and salts. All internal components and surfaces are non-metallic, which makes the Poly-Guard pump an excellent choice for high-purity services. The 4-Series Gear Pumps were designed for OEM applications such as chemical feed systems. 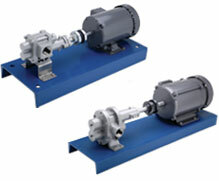 These pumps have a large selection of materials to cover a wide variety of chemical processing applications. A unique feature of the 4-Series pump is its parallel port connections located on the front of the pump. 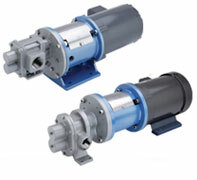 The 2-Series Gear Pumps were designed for low flow applications. Their compact and rugged design makes them ideal for many applications, including chemical dosing and metering, pipeline sampling and wastewater treatment.